This listing is for a 6-button debouncing DIY electronics kit that has 6 input buttons, and 6 debounced outputs. We are also selling these fully assembled and tested for a few dollars more, so be sure to check out our store! When you are working with digital circuitry, using mechanical switches on I/O ports, you may very well introduce a mechanical bounce that is created by the switch that can cause false triggering. When assembled this module implements software debouncing by adding delays internally so that the outputs are not affected by mechanical bounce. The video above offers a full demonstration. The video below offers full assembly and test instructions so that you can follow along with me in the assembly process! There are TWO modes of operation. The first is Momentary mode, which means that the corresponding output will go from 0v to 5v (Low to high) when the relative button is pressed, and will stay high until the button is let go. The second mode of operation is latching mode, which means that when the user presses a button, the corresponding output will toggle high, and stay high until the user press that same button again; at which point the corresponding output will go low. A detailed set of instructions can be found below. We highly suggest that you watch the above video so that you get a feel for how this device works. IT CAN ALSO BE PLUGGED DIRECTLY INTO A BREADBOARD WHEN ASSEMBLED! Before you power up your device for the first time (After assembly), you will notice that there is a four pin header above the first button (S1). Only right two right most pins are used. This module also comes with a two pin header connector. When you place the header connector on the right most pins before power up, the device will start up in latching mode when you power it on. If you leave that header off (unconnected) during power on, the device will start up in momentary mode. This header cannot be changed on the fly. You need to select your mode prior to power on. 5v = This is a regulated 5v line for external interface. It is not necessary, but it is nice to have. GND = This is an external ground line so that you can connect to external devices. Remember, if you are using this to test your arduino or any other device, you need to make sure that this ground line is connected to your external circuit under test. 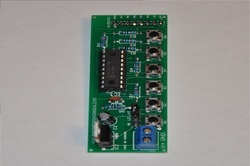 This device (When assembled) can be used to test any 5v compatible digital circuit. It can also be used to activate relay driver circuits. (Latch or Momentary). The sky is the limit! There are four small mounding holes on this board that you can choose to use if you wish. One in each corner. No mounding hardware is included.